Last minute decisions can lead to amazing experiences and walking into the Fukushuen Garden was one of them. Entering the garden, we could hear the rush of water and birds chirping. In contrast to the lively streets of Naha City, Fukushuen was calm and serene. As we explored, we noticed people reading books and relaxing on the benches scattered about the area. It seemed like a place where the locals went to take a break from their busy lives and breathe easy. The thing we loved most about spending time in Okinawa was getting to know what life was like for the people that lived there. If you plan on coming to Japan, please set aside some time to visit. You'll find that the history and lifestyle there is very different from the mainland. 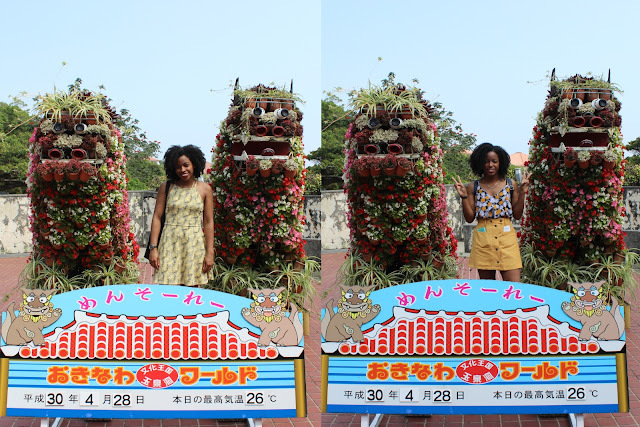 While in Okinawa, we had the chance to check out a couple of places in our first 2 days there. Some of the places we went to included Naha Kokusai Dori, Okinawa Prefectural/Art Museum, Shurijo Castle, and Okinawa World. Below we've included some pictures from the famous Gyoku Sendo Cave in Okinawa World. Upon first entering the cave we began to worry about what exactly we'd gotten ourselves into and honestly we were pretty scared. Everything seemed so surreal, because it was our first time seeing something like it in person. Now, if you're someone that struggles with claustrophobia, I'd recommend that you avoid this place at all costs. However, if you're okay with small enclosed spaces you'll love it here! Walking around the cave we saw so many beautiful rock formations and gained a newfound appreciation for Earth's natural resources. So, if you're ever in Okinawa, please do not pass up this wonderful place! Is it crazy that this is our first trip since last Summer? No? Just us? Okay :) Well, luckily in Japan there is a holiday week known as Golden Week. During this time most people go on vacation with their families and almost all of Tokyo becomes a ghost town. So, what do you do when you're a 'gaijin' (foreigner) and your family doesn't live in Japan? You go on an amazing trip instead! Our destinations included Okinawa, Osaka, and Nara. While in Okinawa we stayed at the amazing Hotel Pesquera and they were very accommodating even though we arrived way after check-in. We definitely recommend that you check them out if you're planning a trip to Okinawa. So, want to know more about our trip? Keep an eye out for our next post.